Sound Radix develops innovative software tools to help you achieve the best sound possible. They prefer smart algorithms, yet easy-to-use and immediate interfaces. Most chances are you'll not see digital emulations of vintage hardware made by them, but rather cutting edge tools, designed to help you get the best job done fast, that otherwise would have been impossible to achieve using analog electronics. Their first released plug-in is Auto-Align. 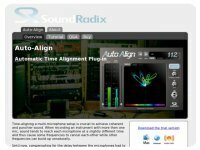 Auto-Align is an innovative, first of its kind Audio Unit plug-in, designed to automatically time-align recorded tracks in multi-microphone recording setup, sample accurate.